Why is Florence Nightingale the patron saint of the Jobs Research Trust? doctrine and practice of another."  Edward Cook, author of "Florence Nightingale"
IN THE AFFAIRS of our Trust, we often talk about "the Florence Factor". This refers to the British nurse Florence Nightingale, who, although she worked in a completely different field, has become something of a role-model for our endeavours. Florence was a wonderful example of how to work for change by carefully distributing good and timely information. She is also the inspiration behind our Trust philosophy of "...not telling people what to think, but giving people the tools to think with." Our Trust co-founder Jo Howard tells the story : "People are usually bemused to hear that our mentor is Florence Nightingale. They usually have a hazy recollection of either the "Lady with the Lamp" or of a bed-ridden recluse wearing a poke bonnet and many layers of voluminous petticoats. Neither is entirely wrong but neither give a true indication of what she achieved.
" She revolutionised health care in both military and civil hospitals in the second half of the nineteenth century. 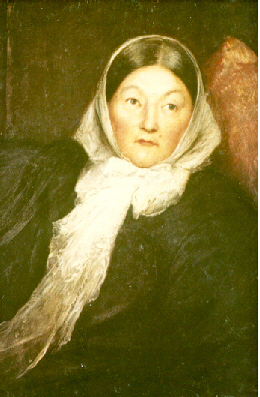 She started the first schools of nursing in Britain and America. Her example lead to the acceptance of women both as nurses and as serious contributors to improved health care in general. She was one of the founders of the Red Cross. She was one the main driving forces of the fledgling feminist movement. She was responsible for many of the reforms in the British army particularly concerning welfare and barrack design.
" She never held a major public office and never held a public meeting. She made herself an expert on the matter in hand by relentless systematic research. She edited the information to make it readily assimilated. She presented the information to the policy makers through the proper channels. If they ignored it she presented more widely. For example if the secretary of a commission ignored it she sent to all the individual commission members. If they ignored it she sent it to members of parliament and other bodies interested in the issue. Only as a last resort did she offer it to the press.
" The information had to be relevant and accurate. If the budding legislation or regulation ignored the information she would ask why. If the answer was unsatisfactory, she would ask the same question of the wider body to whom she had presented the original information. Ultimately she could not be ignored.
" Eventually politicians and civil servants came to the conclusion that it was far easier to work with her. Government departments used her to help draft legislation affecting health and army reforms. The army department and the India office only stopped sending her papers for comment when she was 86 and in poor health.
" She refused all honours but when King Edward VII insisted she become the first woman to be given the Order of Merit she accepted it only if it was delivered to her house without fuss. In her will expressed the wish "that no memorial whatever mark the place where lies my Mortal Coil" and "to be carried to the nearest convenient burial ground accompanied by no more than two persons without trappings." In deference to her wishes the offer of a national funeral and burial at Westminster Abbey was declined. She was buried in the family grave and her plain coffin was carried by six sergeants of the British Army. Her only memorial is two lines on the family tombstone "F.N. Born 1820. Died 1910." " By working like her, we in the Jobs Research Trust hope we will go some way at least to being as effective in our own field as she was in hers. We have 18 years to do the job before our oldest trustee is 86..."
Florence as a "Passionate Statistician"
Florence Nightingale's role in the history of statistics and statistical graphics is of interest for many reasons ... she was the original proponent of "Statistics That Matter". As a social activist, her view was that statistical data, presented in charts and diagrams, could be used as powerful arguments for medical reform. She developed the idea that social phenomena could be objectively measured and subjected to mathematical analysis. She was an innovator in the collection, tabulation, interpretation, and graphical display of descriptive statistics.